It was Friday at 10:30 AM, and I was teaching ionic bonding to my 2nd block chemistry class. It was the day of our first home football game on a brand new turf field, and everyone was excited. The students were learning how to write chemical formulas for substances like magnesium sulfate, copper II oxide, and of course, sodium chloride. My 2nd block class is an interactive group. They talk to each other, they talk to me, and we have open, ongoing conversations about chemistry or whatever is on their minds. It’s a little rowdy sometimes, and when I ask them to stop talking so loudly, I often realize that they are collaborating on their work and simply having fun being together. As I was writing on the board, I showed my kids how the number of positive metallic charges must be equal to the negative charges of the nonmetals. I drew two sodium ions and one sulfate ion to show how the 2 to 1 ratio made logical sense. After finishing a sentence, but just as I started to show a new example, one of my students called out for everyone to hear: “Thank you Mrs. Milam for supporting us with your Nikes!” Surprised by this twist of the conversation, I looked down to see what I was wearing. I scanned over my purple & gold ECHS Indians t-shirt and my blue jeans. I was not wearing Nike. But then, I saw it…the white Swoosh on my black Nike shoes. I felt smug, realizing I had chosen to make a statement with my shoes. Then another part of my brain kicked in and reminded me that it was just a lucky coincidence that my comfortable Friday shoes happened to be Nikes. I responded to my student by looking at her and simply saying, “You’re welcome.” The lesson continued, and the class figured out how monatomic and polyatomic ions bond together to form chemical compounds. In our classroom, we use whiteboards to work problems and draw particle diagrams. On this Friday, each student had a board and a marker and was ready to follow my example. I was showing them exactly what comprises a unit of potassium phosphate, K3PO4. As I drew three potassium ions (K+, K+, K+) and circled each one of them, I saw with disbelief what I was writing on the board. I was creating a visual which would potentially elicit terrible images and high emotions. I quickly drew the single PO43- ion and circled it, making the decision to quickly finish this awful example and move on to a new one. Most of the students were just watching the chemistry unfold, but I heard a few distinct voices mumbling about the three K’s. They all continued following the chemistry, however, and nobody made a big deal about it, much to my relief. One thing I love about chemistry is that it’s challenging enough to keep teenagers engaged and focused. My class still needs more practice, but the students grasped the lesson. Was it because I was wearing Nikes? I don’t know. Would it have caused problems if I had announced a ban on Nike? Maybe so, but who’s to say for sure? Unlike chemistry, issues like these are not always logical, and they don’t have clear-cut answers. They are not as black and white as those shoes I was wearing. The potassium phosphate example was a terrible faux pas. Actually, it was much deeper than a faux pas. It created an image that had the potential to create hate and resentment among the people within my classroom. Of course, the image was based on a harmless chemical example. It was an innocent compound that manifested into an ugly diagram because of some horrible choices made by people in our American history, people who probably believed they were making America a better place for their own children by destroying the rights and liberties of other children. The day before I wore those shoes to school, I watched the new Nike commercial that spotlights impressive athletes in action and is narrated by Colin Kaepernick. It’s a powerful commercial. Nike has found a way to shed positive light on an issue that has become polarizing and messy. Nike has found a way to create bonds among those people who want America to become a better and safer place to live. Nike took the risky initiative to broaden our perspective. They captured the essence of what it means to create change through action. Taking social action alienates those who are not ready for change. It often makes people angry. Taking social action may require breaking tradition and violating etiquette, but in doing so, it initiates progress. Progress is more important than tradition. Progress is more important than etiquette. Progress instigates anger, which is always rooted in fear. Didn’t we learn in school that one of our most beloved Presidents was shot and murdered because of his mission to make America a safer, more liberated nation for all people? Think about it. Has there ever been a significant historical change that doesn’t make people angry? At school, we say the Pledge of Allegiance every morning. “I pledge allegiance to the flag of the United States of America, and to the Republic for which it stands, one Nation under God, with liberty and justice for all.” I always end by saying “Amen.” That’s because in my mind, it really should be a prayer. I have hope that one day we can achieve liberty and justice FOR ALL. Not all people receive liberty and justice. Many entitled Americans probably feel warm and secure with their liberty and justice, but many Americans are left in the cold, not served well by the justice system, and not free to live the way others do. While the Pledge of Allegiance is being spoken by many patriots, its words are shallow and its claims are elusive to many Americans. Just like chemistry challenges us intellectually, Nike has challenged us socially. As much as we value education and scientific progress, these are meaningless endeavors if they don’t accompany the advancement of human rights. Nike asks us: What are you striving to achieve? What are you doing to improve your performance? More importantly, though, what are YOU doing to create liberty and justice for ALL? Joe made his mark on the world. Joe was vibrant. People loved Joe, and he loved people. I knew that I was fortunate to teach Joe Sherwood. I taught Joe Physical Science during his sophomore year and Chemistry during his junior year. I met Joe on my very first day of fall semester at East Coweta High School. Although I had previously taught high school for four years, I was re-entering the career world after nine years of staying at home. Joe didn’t know that I was a bit rusty at teaching and needed some time to warm up. Joe didn’t know that I had never taught Physical Science before, and he didn’t know that I wasn’t prepared for him. Joe passed away this week, and I have been slowly absorbing the truth and trying to understand its meaning. As you read, you’ll see that it’s my personal story. It is – but that’s because I don’t know Joe’s version of events in my classroom. Because he is gone, I can now fully understand the impact Joe had on my own life. More importantly, I understand the impact of our relationship on all the students I have taught since Joe and all those I have yet to meet. Joe wasn’t easy to teach. But, nobody had told me that teaching would be easy. What I learned from Joe during my first semester at East Coweta High School set the tone for the following nine years (and counting). Joe Sherwood illustrated that the classroom was a challenging place to work. He also showed me that teaching is a rewarding job. But most undeniably, he led me to the conclusion that teaching is fun. Joe was charming. He was likable. He smiled big and often. He called people by name. He was loud. He liked attention, and he was good at getting it. He also got angry and frustrated, as humans often do, especially when they are trying to learn chemistry. Because he was so vocal, we usually knew when he was mad, which would sometimes make us mad. I can’t remember any specific event, but I would bet money that we argued with each other during our time together. That’s okay. It is part of our story. Joe’s best quality was his genuine personality. He was authentic and down to earth. He was not afraid to be himself or to speak his mind. When he was happy, we knew it…because he was smiling. When he was sad, we knew it…because he was frowning. When he was angry, we knew it…because he was yelling. When he was excited, we knew it…because he was laughing. And best of all, when he was enjoying life, we knew it…because he was dancing. Through Joe, I could understand how well I was teaching the lesson. If he understood everything, he would answer all my questions aloud….with pride and confidence. He was happy to help me teach the lesson by confirming what he learned. He might even explain the concept more thoroughly to the class. Joe was a leader. He explained things to his peers in his own terms, which is really helpful to us teachers. When class was going smoothly, Joe was happy. When Joe was happy, he laughed and smiled and generated positive vibes. That is also really helpful to us teachers. Positive vibes are always conducive to learning. Joe worked hard at learning. He had a knack for math and science, but chemistry can be especially rigorous and has a well-deserved reputation for being a booty-kicker. Joe had a good work ethic. He never slept in class or used his phone to watch Netflix (it wasn’t invented back then, but he still wouldn’t have watched it in class). In addition to being a football and lacrosse player, Joe was a wrestler. Wrestling is really tough, but Joe was good at it because he was strong and willing to work hard. If Joe didn’t understand a lesson, he became frustrated. When he was frustrated, he became negative and grumpy. That is not helpful to us teachers. Negative vibes can ruin learning, even for the most dedicated students. And, unfortunately, teachers are susceptible to negative vibes. Especially this one. I can quickly spiral downward when the mood turns sour. Teaching Joe was challenging. I didn’t know what to do with these negative vibes, and my own negativity didn’t solve any problems. I don’t know how Joe and I overcame the first academic challenge. I don’t remember if I did re-teaching or if I let a peer try to explain to him or if I just gave up and hoped for a better next lesson. In physical science, I co-taught with a wonderful teacher, Mrs. Alissa Sullivan. I am sure she pushed him to success much of the time. Teaching Joe was rewarding. Although it wasn’t always easy, Joe overcame challenges and understood concepts. Lessons eventually clicked for him, and when they did, he knew the science well. Achieving a goal that is difficult is so much more rewarding than when it is easy. Just like hard-core exercising is more rewarding than watching television. Right? I don’t remember how it quite came about on a particular fall day in 2008, but the song “Cotton-Eyed Joe” began playing on my computer. Joe immediately hopped up from his chair and started dancing. It was clearly “his” song, and one of his classmates joined him for as long as she could keep up. I’m pretty sure there were a few hoots and hollers from him or from the class. Joe’s joy was contagious, and I remember how much fun we were having with him. Somewhere along my journey with Joe, I realized that making Joe happy had a positive effect on his learning. And making him more successful made everyone else (including me) much happier. Note: There are many teachers who firmly believe it is NOT their concern or responsibility to ensure that their students are “happy.” I do not understand that philosophy. If you are one of those teachers, you may wish to stop reading my story. I liked making sure that Joe was happy. We laughed at his jokes, and he laughed at mine. And when he laughed, everyone else did too. As I said, he was a leader. He was magnetic, and people sensed his emotions. Like Maya Angelou’s quote, we don’t remember any specific words or any particular conversation, but we know that we felt good about life when Joe was in the room. He made us feel like the sky was shining. My friend Stefanie Easterwood reminded me that Joe was a close friend to Ryan Carter, who has cerebral palsy and who shares the joy of life that Joe shared with us. He enjoyed a friendship that many people simply could not do. He was a truly special person. Teaching Joe was fun. We continued to play music. We continued to tell jokes. I praised him for learning tough stuff. His friends praised him, and he made them feel needed. We encouraged him when he got down, and he rewarded us with his contagious joy. Most students don’t show their emotions like Joe did. Many students are quiet and don’t let anyone know what they’re thinking. That’s okay, and I was one of those kids. But, every student feels the same emotions that Joe did. Joe expressed the feelings on behalf of his classmates. He expressed anger and frustration at not understanding something. He expressed the happiness that comes from achieving success. Joe was an open book, and he was exactly what I needed to see as a teacher. I needed to understand the direct relationship between my student’s emotional well-being and their ability to learn. Teaching high school is so much fun. This is why. There is most likely research to support the discovery that creating a happy, positive environment leads to an increase in learning for all students. But in 2008, I was too busy teaching Joe to read that research article. And teaching Joe was a lot more memorable than any article I have ever read. Maybe one day we will find a book titled “Teaching is Challenging, Rewarding, and Fun.” But for me, that book has already been written. Not on paper, and not in words, but in real life. And that book was written by Joe. It has been dedicated to me and all his teachers. And his legacy will benefit many students for years to come. Looking online, I have seen stories of how kind Joe was. I know that about Joe. He had a giving spirit, and he delivered a wholehearted hug. My former student Kiera told the story of how Joe stayed behind with her and her classmate Ryan because their wheelchairs prevented them from joining the rest of the group on a field trip. He made her feel important. He had the self-confidence to stand with Kiera and Ryan instead of going with “everyone else.” Who has that kind of confidence? Who has the wherewithal to know how meaningful that decision was? (I don’t). Joe had that kind of confidence. And because of that, many people in our community are better for knowing him. Joe’s work on this Earth is complete. While his life was shorter than we expected, I know that God crafted Joe to be exactly who we needed him to be. He created the one and only Joe Sherwood to shape our lives in a very deliberate way. He placed Joe in our paths, in our families, and in our classrooms. I am thankful that God selected me to be Joe’s science teacher. Twice. God chose me to teach Joe for a reason, and it is now crystal clear to me what He was doing. As I was teaching Joe, God was teaching me. Postscript: Joe’s mother, Cindy, is a fellow teacher at East Coweta High School. She is a colleague who has thanked me generously on several occasions for my work with Joe. She knows that Joe struggled in his classes. She knows that he wasn’t always easy to teach. But because of that, she is truly thankful. I sincerely appreciate her kind words since Joe graduated. Her words inspire me to keep working hard at this job. I know this is work worth doing. Just five days after Christmas, I went to the theater to watch the movie Concussion. I actually read the book over the Thanksgiving holiday, so I knew the story and was eager to see Will Smith in his starring role as Dr. Bennet Omalu. While reading the book was a personal experience, seeing the movie produced by Sony Pictures would allow me to see the story that all of America would see. True stories are always the most fascinating, and this was no exception. Concussion is about the power of science and the ability of one person to make a big impact. It is about overcoming social barriers and pursuing the American dream. All the stuff that makes a great story. This is the story of a doctor’s discovery and the journey to share his message. Dr. Bennet Omalu immigrated to the United States from Nigeria. He wanted to leave his home country in the past and longed to become 100% American. He found most things to be better here than in Nigeria, but he discovered something he had never anticipated: racism. While it played a factor, his race wasn’t the major obstacle that he confronted. The combination of his African heritage, his devotion to God, his intelligence, and his charming quirkiness made it difficult for him to fit in. His colleagues in the medical profession didn’t take him seriously, and the NFL certainly didn’t want anything to do with him. Dr. Omalu performed autopsies on NFL athletes and performed accurate scientific analysis to detect the condition that he would name “chronic traumatic encephalopathy,” known as CTE. Before his discovery, doctors struggled to diagnose the players, and they categorized the condition as a form of Alzheimer’s. This medical label didn’t make sense to Omalu because the players were often in their 40’s and 50’s, much too young for Alzheimer’s disease. While Omalu knew nothing about the game of football, he did come to know some of the players. Unfortunately, he met them in the morgue, after their bodies has succumbed to the effects of brain disease. One of the first things he learned about football was that too many NFL players (and their families) suffered debilitating, often fatal, physical descent as a result of playing the game. The NFL had formed their own team of doctors. Their publicized goal was to study concussions, but it was headed by a rheumatologist, not a neurologist. Their job was apparently to protect the NFL itself, not its players, and they were used as a defense to block Omalu’s research. The story takes place in Pittsburgh, one of the greatest football cities in history, and its fans are rooted in tradition, not cutting-edge science. The fact that many retired Steelers players ended up with terrible brain disease was a wake-up call to NFL families and fans that something serious was going on with their once-invincible heroes. You can read actual critic reviews about the movie or the book on many websites, and I am not trying to replicate those. My insight originates from my role as a science teacher and STEM advocate. This story represents the core of what we are trying to teach our students. Real science is based on accurate data collection methods, repetition of experiment, and unbiased analysis of results. Real science proves itself through the quality of the research. It’s easy to “tell” the students how science works, but telling them is not nearly as effective as showing them a real-life story produced in Hollywood. As we know, scientists conduct research and then publish their work in scientific journals. In reality, however, scientists do more than that. They must market themselves, present their positions, and often play a game of politics. 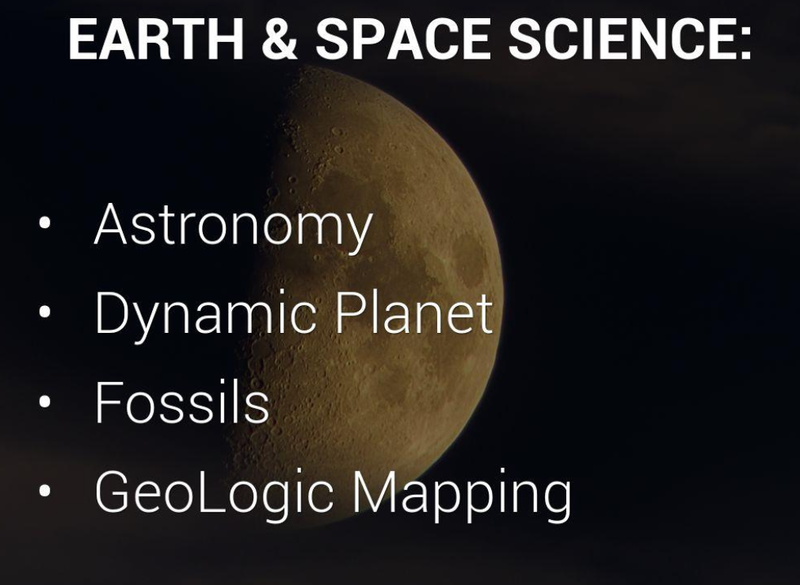 If their work is to become meaningful, then the scientific community must support them. In Dr. Omalu’s case, his findings were being discredited by the NFL. Not because he was wrong, but because his findings could potentially change America’s game. First, the NFL could face losing enormous amounts of money in lawsuits. Secondly, but perhaps more fundamentally, his science could rip out our American hearts by crushing our idealized vision of our beloved sport. I love to show my students the movie Einstein’s Big Idea, a film that highlights the careers of several world-changing scientists. Students learn that Lise Meitner was not duly credited with the discovery of fission, the concept that fueled the atomic bomb and nuclear power. Because she was a quiet Jewish woman, she did not receive the recognition she deserved, and the Nobel Prize went to her partner instead. Dr. Bennet Omalu’s story reminded me of the story of Michael Faraday, as it is told in Einstein’s Big Idea. I will give a brief review of his life to illustrate the parallels between 19th Century Faraday and the modern day Omalu. Faraday’s work in electromagnetism led to the invention of the electric motor, which, of course, changed the world dramatically. Because Faraday was not formally educated and not born into upper class society, many people did not “believe” his science. Faraday proposed the idea that electromagnetic force fields project into the empty space around a conductor. Because the elite scientists of University of Cambridge had never proposed such theories about how electricity and magnetism interacted, his colleagues figured he couldn’t be right. Because it was Faraday, the lowly son of a blacksmith, who first described electromagnetic behavior, it was not until after his death that his findings were accepted. Another driving force behind Faraday’s work was his faith in God. He actually turned down several titles of distinction, including knighthood and presidency of the Royal Society, because he did not want to accept personal fame. He viewed his contributions to science as a way to serve God and as a way to become closer to the One who created our world. Albert Einstein respected Michael Faraday as being for his role as a scientific pioneer. Faraday paved the way for others to discover groundbreaking principles in science, technology, engineering, and mathematics. His concept of electromagnetism is now one of the first scientific concepts we teach our children, but at the time of its discovery, it was discredited as foolishness and as nonsense. Dr. Bennet Omalu has a strong faith in God and is very open about his beliefs. He looks at his scientific work as part of a bigger picture, much like Faraday did. Omalu noted that God created woodpeckers and rams to sustain numerous blows to the head, but He did not create the brains of men to withstand those same types of injuries. Pointing out these facts to fellow scientists did not win their favor but, instead, made them question Omalu’s scientific reasoning. Although Dr. Bennet Omalu is an extremely educated man, he faced the barriers of being Nigerian, being religious, and being quirky (albeit in a charming way). At times, he was disclaimed because he didn’t know anything about football. Imagine that…having your scientific discovery discredited because you don’t know anything about football! Although he is a leading neuropathologist who had studied the brains of deceased football players, the NFL quite intentionally shut him out of their conference on concussions. Apparently, they wanted to be able to publicize their interest in concussions, but they had no interest in the true science that was happening in the heads of their players. As Americans, we love our NFL players, but the NFL itself didn’t seem to care much about their health or their family lives. Their interest was only in the financial value that the players brought to the business. Doing science accurately and honestly may not be easy, and, in the case of Dr. Bennet Omalu, it can be heartbreaking at times. But, scientists have the power to create change in our world. Scientific discovery can help improve lives and make our world safer, brighter, and more prosperous. In this case, it is obvious that the rewards of the discovery can help save and protect the lives of football players of all ages. Even with the advent of CTE, the game of football is as popular as ever. The future of this story is in preventing or curing the disease, and the research on CTE is still newly developing, thanks to Dr. Omalu. In order to teach the stories behind science, I have recommended many books to my students, some of which include The Girls of the Atomic City, The Radioactive Boy Scout, The Disappearing Spoon, Uncle Tungsten, and The Making of the Atomic Bomb. All these stories are fantastic, but they are history. While many adults enjoy history, young people are usually less than thrilled to read something historical. Anything that may soon be on Netflix, on the other hand, is something that just might spark their interest. Concussion is a story that begins just before 2005 and is still unfolding. It is not history. It is real life, and it is happening now. And, better than that, it’s about NFL football. I cannot imagine a more captivating person or topic for a movie. It is a story about football, but the hero is a scientist. It doesn’t get any better than that. Whether or not the film receives any Academy Awards is beside the point here. As the movie shows, groundbreaking science is often not recognized or honored right away. Hollywood does not generally reward true science, but it serves to portray it on screen for those of us who are willing to pay for it. Fortunately, or not, scientific breakthrough is often the basis for a riveting story, and for those of us who love to see the advancement of STEM, we relish such an adventure. On behalf of STEM educators, thank you to everyone who wrote this story and to those who brought it to the big screen. And of course, thanks to Dr. Bennet Omalu for your exquisite research and for following the path laid out for you. Thanks to the support of the outstanding Coweta County School System, I was fortunate to become a contender for the Georgia Teacher of the Year (TOTY). The first part of this post is a thank you to each of my colleagues who have helped me, and the second part is a memoir of the thrilling 3 week run I experienced as a TOTY Finalist. On April 25, my assistant principal asked me to take a phone call during class. (For those of you who don’t work in a school, teachers don’t take phone calls during class). He had a big smile on his face, and I quickly figured out what this call would bring. On the other end of the line was Georgia State Superintendent Richard Woods, who explained that I had been chosen as one of ten finalists for Georgia Teacher of the Year. He told me that the state was proud of my work, and I was immediately honored, knowing that I work alongside many wonderful teachers. Five months earlier, I submitted the seven essays that comprised the Georgia Teacher of the Year (TOTY) application. I wrote narratives on the topics of professional learning activities, my biography, community involvement, my teaching philosophy, the teaching profession, education issues and trends, and a speech that I could deliver as teacher of the year. Over the next few days, I was showered with sincere, warm wishes from administrators, teachers, students, and families from across Coweta County School System. The cashier at Publix and the Starbucks barista wished me well, having seen my picture on the Newnan Times-Herald’s Facebook page. It was during that time that I knew this honor was a win for our county. Yes, I had written those essays as an individual, but every sentence I wrote was based on my experiences as a representative of Coweta County Schools. Since 2008, I have taught more than 6,330 hours at East Coweta High School (ECHS). Not a single one of my lessons is a product of my own individual planning, but they are a result of all the teaching strategies I have gathered from teachers on my chemistry team and in my ECHS family. Assistant Principal Patrick Sullivan and Department Chair Stefanie Easterwood keep our science department running smoothly and efficiently. They set high standards for us, and our teachers always deliver. I admire each of the science teachers at ECHS for their unique style and expertise. 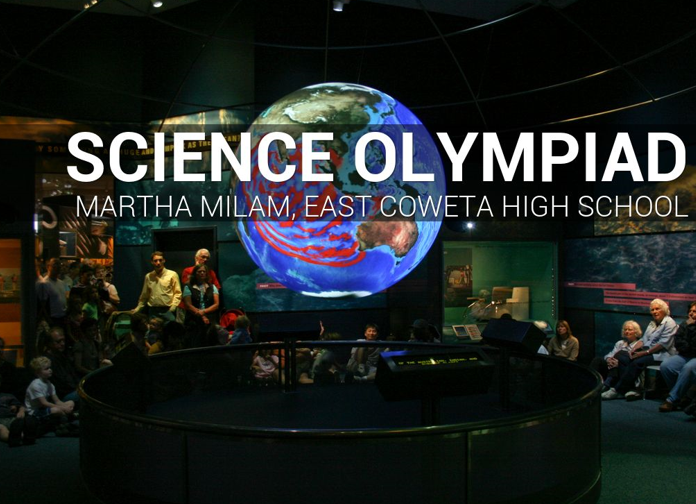 One of my proudest achievements, our development of the East Coweta HS chapter of Science Olympiad, has been a group effort. While I am the designated head coach, there would be no team without the dedication of Candice Mohabir. Heather Conlin, Regina Ahmann Karen Pompeo and Stefanie Easterwood also support the team and have spent several long Saturdays with our awesome STEM kids. Our Science Curriculum Specialist, Dr. Donald White, has truly made STEM come alive in Coweta County. We do so much STEM that we have a Symposium every April to show off all the many STEM-tastic things going on in our schools. Our STEM success would not be possible without Dr. White’s enthusiasm. Along with my technology-saavy friends Micki Byrnes and Matt East, I have had fun presenting at conferences as well as coaching our ECHS friends in all things Google. I appreciate my editor Kelly Jackson (who not only corrects me, but gives me confidence) and my buddy Brent Walburn, who knows when it’s time to take a much-needed break for ping-pong or hula hooping fun. My wonderful friends at Northgate and Newnan High Schools have mentored me in AP Chemistry: Orla Thomas, Cathy Pugh, and Kelley Finger. I have called on each of them in times of urgent need, and they always respond quickly. Superintendent Steve Barker, Dr. Karen Barker, Board Member Amy Dees, along with Dr. White and Mr. Sullivan graciously wrote recommendation letters for my application. My dear science team friends have been the greatest support system I can imagine. We are closer-knit than an ordinary group of colleagues; we are a family. When one of us is down, we lift each other up. When one of us is happy, we celebrate together. I don’t know how I got so lucky to be in this family, but I thank God for allowing me to be part of this special group. Now…let me tell you about the biggest 3 week, 3 day roller coaster ride of my life. Yes, roller coasters are fun, and you stand in line for hours anticipating the ride, but, at certain points, you have the urge to toss your cookies. And when you’re flipped upside down, you always double check to make sure your seat belt is buckled up tight. Giving speeches creates a huge emotional dichotomy for me. The thought of public speaking makes my heart beat much too vigorously, but at the same time, I absolutely love a good motivational speech. I also have quite a lot to say about the field of education and STEM, so I am always ready with material. When Superintendent Woods called, it was two days prior to our Coweta County Teacher of the Year Ceremony. I had been asked to give a speech to congratulate all thirty-one of the 2016 Teachers of the Year for our county. Still reeling from the news of Prince’s sudden death only a few days earlier, I wrote a message as all the songs from the Purple Rain soundtrack swirled through my head. I told the teachers that they will never live the glamorous celebrity life or reach worldwide fame, but that they are the real rock stars in our communities. The three finalists for our county delivered wonderful, heartfelt messages, and we celebrated Shannon Ewing, our 2016 Coweta County Teacher of the Year (TOTY)! After this excitement subsided, a short 4 days remained before the AP Chemistry exam that my students would take. It was crunch time, and it required every bit of my energy to equip the kids by reviewing every piece of information we had learned since August. On Tuesday, May 3, the AP exam was over. It struck me like a bolt of lightning that I had 9 days remaining to prepare for the biggest event of my career. It was time to focus on May 12, the day that the TOTY finalists would meet at the Georgia Department of Education. Over the next 9 days, about half of my energy was spent studying and doing research. The remaining half of my energy was spent on figuring out how NOT to worry about my May 12 performance. Part of my strategy was to talk to my family, my students, and my teacher friends about my anxiety. Talking about my concerns made it seem less overwhelming and prevented me from building up a collection of frazzled nerves. Former Georgia TOTY Lorraine Johnson, Principal at Madras Middle School, made me smile as she told me her own stories of successes and mishaps that happened as she went through the finalist process. The other part of my anxiety-reducing strategy was to fully prepare. I did extensive research on everything that would be important for May 12, “judgement day”. I watched YouTube videos of TOTY finalists from both Georgia and South Carolina. I watched Ellen DeGeneres interview the National TOTY. I read through the Facebook page of Ernie Lee, our well-chosen 2015 Georgia TOTY. I studied a variety of TED Talks videos, hoping to learn presentation strategies and gather material for my speech. Watching NBC’s TODAY Show, I paid close attention to see which presentation styles I liked the best. I read books on what makes a good TED talk. I analyzed every word I spoke in order to improve my own style. There was more research I could do, but if I was going to remember to pick up the kids from soccer and cook dinner, I would have to take some breaks. I finally got down to business and started on the 3-minute speech. Armed with the book titled Speeches That Changed the World, I began writing. I had picked up this book years ago, because I do love a good speech. I studied speeches delivered by Abraham Lincoln, Winston Churchill, Martin Luther King, Jr., and John F. Kennedy, Jr.
For two days, I wrote my heart out, and the result was a perfect rendition of everything I needed to say to the teachers of Georgia. I read it out loud, and it sounded terrific. All 9 minutes of it. The speech needed to be 3 minutes, maximum. The majority of it, two-thirds, needed to be cut. So, I chopped, edited and trimmed. On Mother’s Day, after the gifts and cards, while we still sat at the dining room table, my own mother and dad helped me revise the speech. That’s right….this was not a Mother’s Day for napping, gardening, or watching Hallmark movies. On Monday, 3 days before the big day, I started memorizing and figuring out how to best structure the words. That evening, my husband asked me to give the speech. After a few times of hearing me say it out loud, he took the paper and marked it up with breaks and pauses so it would flow better. My speaking voice needed to improve. I complained to him that I wanted to do it my way because I sounded just like Martin Luther King, Jr. He stopped me and gently explained to me that I didn’t actually sound like MLK. Hmmm….maybe I didn’t. I went to bed, disappointed that my husband hadn’t told me how wonderful I was, but that he had given me constructive criticism. I guess I had to accept the feedback if I wanted to get this right. By 6 AM on Tuesday, I was wide awake. I walked outside in the yard with my dog Bentley and started practicing the speech with my new voice, my new syntax. It was starting to sound better, and by 8 AM, I had practiced the speech at least ten times. Although I rehearsed it numerous times at home, it was now time to deliver it to students and teachers. I set up a podium in the classroom and practiced with a group of kids and teachers. I encouraged them to give me feedback, both positive and negative. No matter what they thought, they were all required to clap really big at the end. What did my own children think about all this business? Well, they had heard that the Georgia TOTY was awarded a car to use for travel during a one year sabbatical. The thought of having a new car to take the place of our 2005 minivan was very exciting. Instead of a Toyota van, we could have a TOTY car, which would undoubtedly be extremely sporty. I came home from school and gave the speech to the video camera. I did this several times – while wearing the dress and shoes that I would wear on May 12. Yes, I know it sounds goofy, but it was a tip I had found in all my research: practice in front of the camera wearing the same clothes you will have on for the real deal. I took Wednesday, May 11, off from work. The plan for the day was to relax (ha!) and to read 2016 Top Ten Issues to Watch, a publication that had been mailed to me right after I became a finalist. There were quite a few educational initiatives and acronyms that I needed to learn to be ready for the interview. Throughout my day off, I reviewed my seven essays in order to have material ready for the interview. I rehearsed answers, and I typed out a list of reasons why I love being a teacher. By Wednesday, I hadn’t consumed any caffeine for over a week. So much adrenaline was piping through my veins that I had cut back on all my coffee and tea consumption. My husband had given up on drinking the coffee I brewed in the mornings – it was all decaf now. I was living in a state of heightened awareness, and I definitely didn’t need anything preventing me from falling asleep at night. At my gym class that morning, I did bigger high kicks, deeper knee squats, and longer lunges than I have ever done in my life. My body was filled with so much energy that someone could have bottled it into tiny packages and sold them at gas stations as five hour increments of wide-eyed awakeness. The big day finally arrived. It was Thursday, May 12. My husband had gone to work, the kids were at school, and the dogs were wondering why I was at home. My parents had planned to drive me to Atlanta, and they picked me up at the scheduled time of 9:30 AM. As we drove, I had the most unusual feeling….I wasn’t nervous. Why wasn’t I nervous? I wasn’t quite sure, but I just enjoyed the feeling. It had been a long time since I felt relaxed. The big day was here, and I was prepared. I was ready, and I had practiced well and I had practiced enough. I have never felt fully prepared for anything in my life. But on this day, I was ready, and it felt good. As we got off the interstate and approached our destination, I appreciated the fact that I didn’t have to make the drive myself. First of all, as we maneuvered all the hectic lane changes as I-75/85 approaches I-20, I wasn’t sweating like I normally would. Secondly, as we drove past the Georgia State Capitol building, I looked up and saw the bright, shiny gold dome. The perfect blue sky behind it made it so stunning and so beautiful, and I realized I had never really looked at it up close and seen its magnificence. I was born and raised in Georgia, and all of my work has been dedicated to improving our state, so this moment struck me profoundly. I felt immensely proud at that moment to have been invited to this occasion. On this day, I would represent all the many superb teachers in Coweta County. I was also looking forward to meeting the nine other teachers who were wonderful representatives of our chosen career. As I arrived at the building, I was confident and ready to meet the judges and finalists. One by one, I met each of the nine TOTY finalists. I sensed that we were all eager to meet each other because we were the only ones who knew what it felt like to live in these “finalist shoes” for almost three weeks. I had conversations with several of the teachers. I remember Heather Cocke agreeing with me when I mentioned that the last few weeks felt like a combination of preparing for either a wedding, a beauty pageant, or to run as a candidate for President of the United States. Finalist Sara Wilder had on a similar dress to mine, and I told her that, when planning what to wear, I had looked up the videos of previous finalists. She said she had done the same thing. Ha! I was starting to realize that my peers had prepared in much the same ways I did. At lunch, I sat right between my high school science colleagues Debra Russell and Casey Bethel. We were thrilled to represent science and talked about our schools and the classes that we teach. I asked Debra to smile at me while I gave my speech, and she did just that. She even nodded her head at my important points and wrote me a little note telling me what a great job I did. No wonder she was a TOTY finalist! With Kiera Patterson (ECHS ’11, GT ’15) and Candice Mohabir…All 3 of us are GT Graduates! In almost exact thirty minutes, our group of ten delivered our carefully prepared speeches. They were all wonderful, and many great stories were told. Superintendent Woods and the three judges listened carefully and intently to our messages. I knew that all of our hard work had been worthwhile. While we ate lunch, Superintendent Woods congratulated us and spoke admirably about everything we had to say during the speeches. After lunch was the scheduled time for my interview. I walked into the room to sit at the assigned table. I faced a daunting row of three tables, side by side, at which the judges sat. It reminded me a bit of a police interrogation, but I quickly dismissed the thought from my mind. After an initial moment of trepidation, I felt quickly at ease because the judges were all genuinely kind and likable people. They asked me questions about the culture of my classroom, my view on social media’s role in the classroom, and a few questions about those educational issues I had been reading about. There didn’t seem to be any right or wrong answers, but the judges simply wanted to get to know the finalists through these conversations. In response to one of the questions they asked, I explained that a teacher has many responsibilities but that it’s virtually impossible to get it all done by the end of the workday. I then told a story that was meaningful to me. As the story goes, one day I was going on and on to my student assistant, Chandler, about how much more I needed to get done before class started. I complained that my “to do” list was too long and impossible to conquer. After Chandler had left for the day, I discovered a note he had written and taped to my computer screen. It was one of those small yellow legal pad papers, and he had titled it “Mrs. Milam’s To Do List.” There was one single item on the list: “Teach Kids Chemistry”. Chandler had actually been a student in my chemistry class the prior year. He was one of my top students, but he wouldn’t have noticed the little things that may have been left undone on my list. His simple message made it clear that, at the end of the day, if we have taught our kids well, then we have fulfilled our ultimate role as a teacher. I never planned to use that story in my interview, but I was glad to have the opportunity to tell it. Throughout this conversation I included many of my experiences at ECHS. The interview session was a great experience, and I was honored that such great educators were interested in what I had to say. Afterwards, I had the opportunity to hang out with finalists Mario Miranda and Casey Bethel. It was fun chatting, and I was glad that the “judging” was over for me. That evening, I relished the fact that the big day was behind me….no more planning, no more fretting. I slept better than I had in quite awhile. At work the next day, I had renewed energy because I would now be able to focus on my classes and on all the end-of-the-year details. I thoroughly enjoyed the weekend and took my son to a soccer tournament on the north side of Atlanta, enjoying the sunshine and the time with my son and his friends. Monday, May 16 arrived, and I knew that this week would bring the announcement of the new Georgia Teacher of the Year. I was ready all day, eagerly awaiting the news. By the end of the day, we heard nothing. On Tuesday morning, I was certain that this was the day we would hear the announcement. By the end of Tuesday there was no news. Wednesday, I thought, would be the perfect day for an announcement. Mid-week…I should have predicted this. Wednesday evening arrived, and we still heard nothing. By Thursday morning, I gave up. I figured that they were waiting until Friday to publicize the new Georgia TOTY. In the back of my mind, I considered that maybe none of this had ever happened. Maybe this whole Teacher of the Year thing was just a weird dream I had imagined. My friend Stefanie wanted me to text her as soon as I heard the news, but others were more cautious. My friend Candice asked “You don’t want us to talk about Teacher of the Year, do you?” A few people felt like they were walking on eggshells around me, but I was still eager to talk about it. As the week progressed, I told my husband that I was starting to worry about how I would react when I heard the news, regardless of the outcome. As I considered how it might turn out, I quickly fluctuated between thinking I had a 10% chance of becoming the Georgia Teacher of the Year and being fully confident that I would be the chosen one. About 4:30 on Thursday, I was working at my school computer when my phone rang. Candice had already left work, and on her drive home, she called to ask if I had heard any news yet. I said no. Why would she ask me this? She knows I would tell her right away. She cautiously told me, “Well, I just heard on the radio that they announced teacher of the year today.” She paused, waiting for me to say something. I quickly searched Georgia Teacher of the Year on the computer. In a few nanoseconds, I found information on both Twitter and ajc.com. The Georgia Department of Education had just announced Casey Bethel of Douglas County as the new Georgia Teacher of the Year. Well, here it was. The big moment I had been waiting for….it was really happening, and, as far as I could tell, I was doing okay. One thing that I had known the whole time is that I would know the person who would bear the title as Georgia Teacher of the Year. One of my nine new friends, one of these awesome finalists, would become the teacher representative for our state. No matter which teacher they chose, I would be happy. We would all be well-served by the selection. On Twitter, I saw the photos of Casey being showered with balloons in his classroom. He was teaching class, just like it was an ordinary day. He looked surprised and thrilled to become the chosen teacher. I was happy for him, and I was proud to see him looking like a true science teacher in his feature photo. Wearing his lab coat and holding a molecular model, he beamed a big smile and looked just like a State Teacher of the Year. Casey Bethel, 2017 GA TOTY! Was I disappointed that I didn’t win? Not too much, and only for an hour. Then I got over it and started thinking about the next school year. Did I want to be the Georgia TOTY? Yes and no. Sure, it would have been fun, but it is a busy time traveling and meeting fellow educators. It is time spent outside of the classroom, away from students. As much as I love being with other teachers, it’s the kids who give me energy. If you ask me how I feel about being a GA TOTY finalist, I will tell you that it was a wonderful experience and that I am genuinely happy about how it all worked out. …I know Casey Bethel will be an awesome Georgia Teacher of the Year. He is energetic, filled with passion for teaching, and has a warm, friendly personality. He will do a tremendous job representing our field. …I realize what a true privilege it has been to be part of the ten finalists. I am proud to be part of the Coweta County School System and proud of all that we have accomplished while fulfilling our mission to serve students. …I can spend this upcoming year teaching AP Chemistry to our terrific STEM kids. 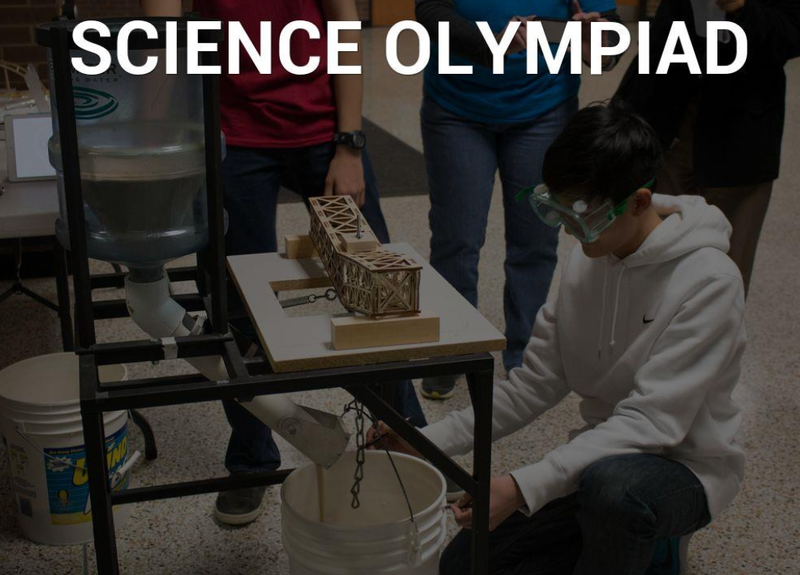 …I can be at ECHS everyday during my daughter’s senior year and be part of her leadership experience with Science Olympiad. …I will be able to drive my 8th grade son to school every morning for his last year in middle school. …I can give a speech every day to the people who truly ignite my passion for teaching: the students in my chemistry classroom. …I can spend every day with all of my best friends. …I can get home every night to eat dinner and hang out with my husband, our kids, and the dogs. I have some new projects in store for next year, including writing for Chemistry Solutions, the periodical for the American Association of Chemistry Teachers. I also plan to finish writing my novel, a thriller about teenagers who use their STEM skills to solve a mystery that strikes their community. Meanwhile, I will be resuming my morning caffeine habit and sleeping well at night. WHY is STEM Education So Critical Right Now? 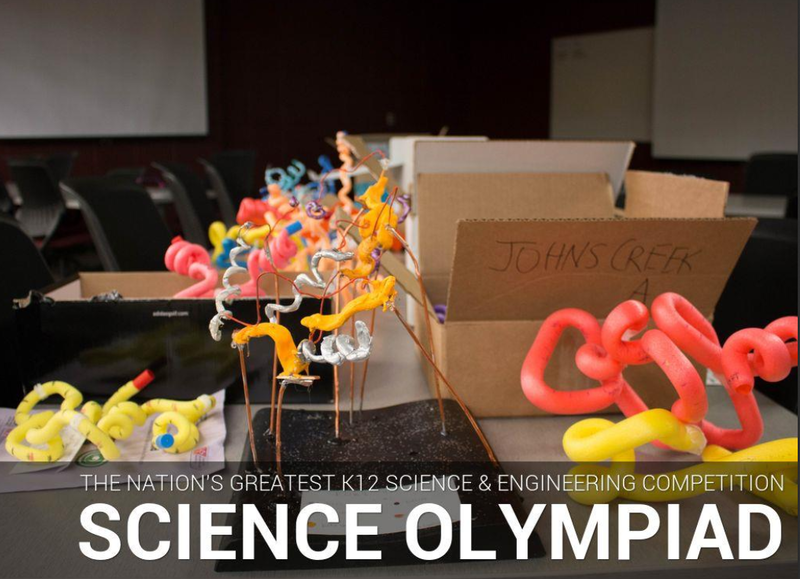 Our Science Olympiad Team at East Coweta High School was one of six finalists in the state of Georgia for the “Best STEM Extracurricular Activity.” The Technology Association of Georgia, knowns as TAG, compiles a list of great STEM schools, activities, and outreach programs. The Awards Ceremony is a gathering of some of the state’s most passionate STEM advocates: a group of business leaders, educators, political leaders, military, government, and non-profit employees. My colleague Candice Mohabir accompanied me to the event. The two of us piloted our Science Olympiad team over seven years ago and have grown the team from a meager fourteen students to our current sixty-plus kids. The awards ceremony was a full day of celebration of the impact that STEM education is making in our state as well as encouragement to continue the mission to STEM educate our students. Governor Nathan Deal and Lockheed Martin’s VP Shan Cooper were keynote speakers for the event. In order to relay the valuable information and inspiration from the day, I created a Google Slides presentation for my students and peers. I am sharing that with you here, so enjoy! 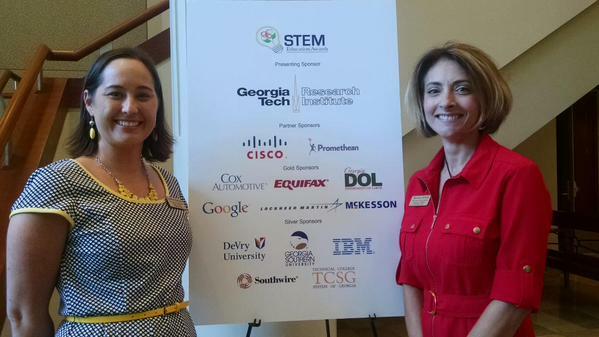 Candice Mohabir and I at the STEM Ceremony at the Carlos Hellenic Community Center in Atlanta. 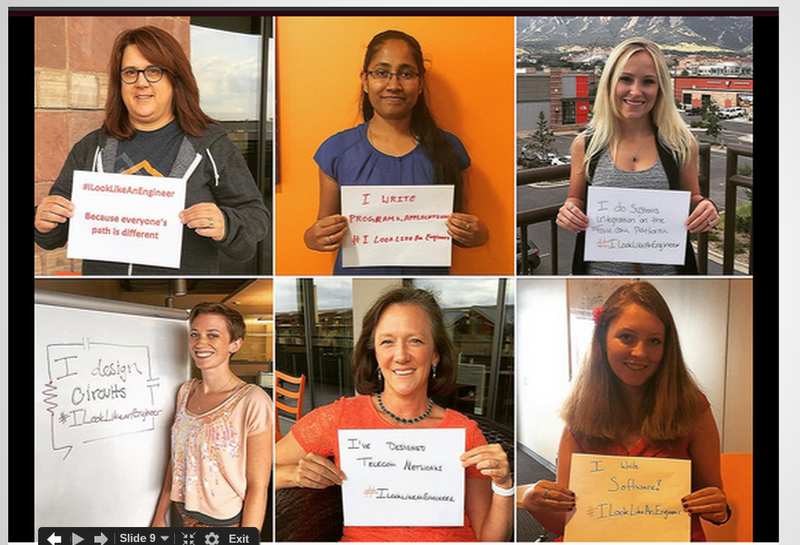 We need to promote STEM to females and minorities to encourage them to not “shy away” from STEM careers. During the final week of July 2015, I attended the National ChemEd conference. Because it was located in Kennesaw, Georgia, it was easy for me to participate, but I discovered why people traveled from far and away to attend. This conference was the epitome of professional learning for chemistry teachers, a gathering of like-minded people who assembled for what was likely their last week of summer vacation. I met several people like myself: people who are somewhat introverted, but who persuade ourselves to be extroverted for the sake of our careers. And for the sake of energizing our students. We oohed and aahed over chemistry demonstrations. We contorted our eyebrows in puzzling confusion during lessons that stretched our minds. We laughed at corny jokes about atoms, moles, and chemical reactions. We talked about stoichiometry and voltaic cells as easily as we discussed what we might eat for lunch. We discovered new experiments, just when we thought we had seen them all. Most significantly, we learned that those of us who teach chemistry LOVE doing what we do. Teaching chemistry is not easy. First of all, the material is difficult. Even chemistry teachers have to keep learning to understand it from every angle. Secondly, it’s challenging for students. Providing rigorous coursework is great, in theory, but many students resist challenges. SO – part of our job is motivating students to learn. And once we motivate the students, we need to make sure the kids understand the highly conceptual topics. Finally, we need to convince our students of how critical chemistry is, in our personal lives as well as in our society. We need to prepare a sufficient amount of students to take over the ambitious task of doing chemistry and of keeping our communities and our nation competitive, innovative, and strong. After I attend a conference, I usually end up carrying around a mishmash of colorful handouts and business cards. I carry them for a couple weeks hoping to assimilate my new knowledge and then I end up stuffing them into a drawer. With this blog, I hope to compile the best of the information I gathered instead of keeping it all in the proverbial drawer. Of course, I have the electronic files that were shared by most of the presenters, an invaluable tool that is easy to find when I need it. 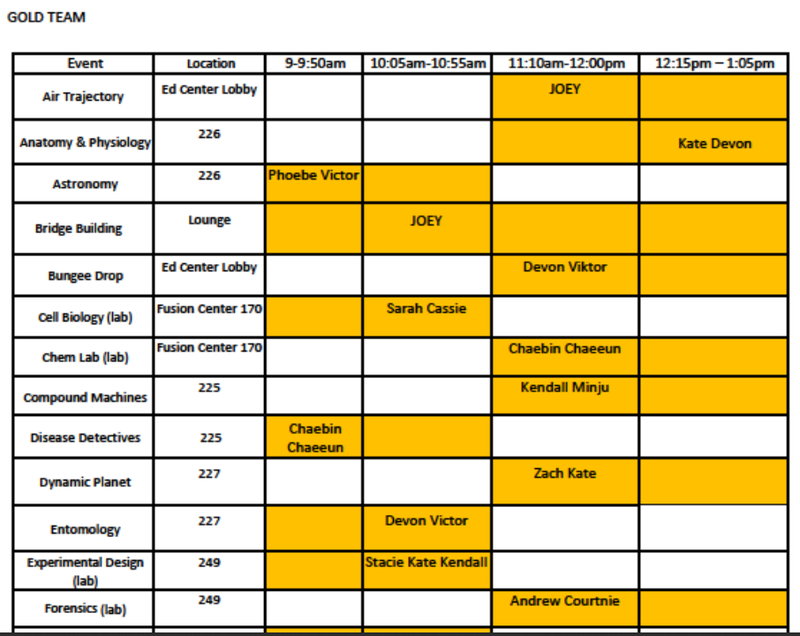 Below is a summary of my personal highlights of the ChemEd Conference. Thanks to ALL who contributed and worked hard to deliver original, useful resources for us. Ramsey Musallam inspired us to reach students through curiosity, rigor, and a bit of fun. 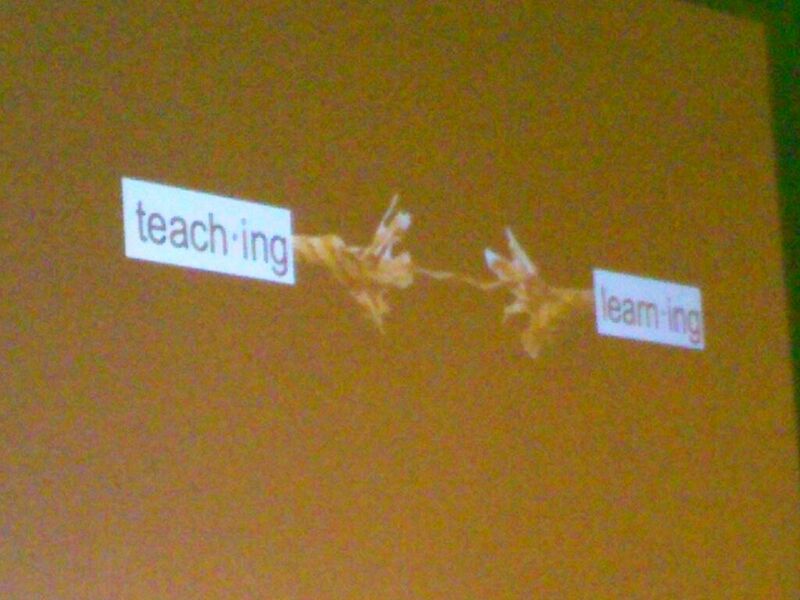 He challenged us to find a way to cross the bridge from teaching into learning. 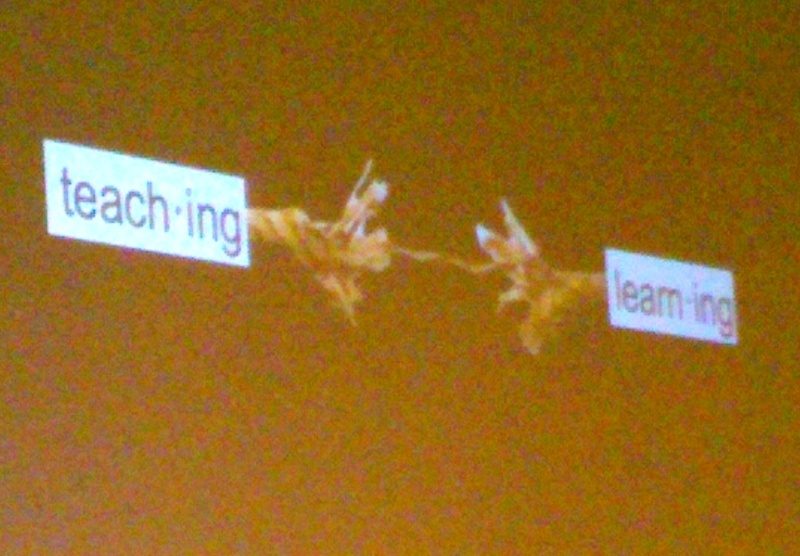 Because teaching can only be “great” if learning takes place, right? 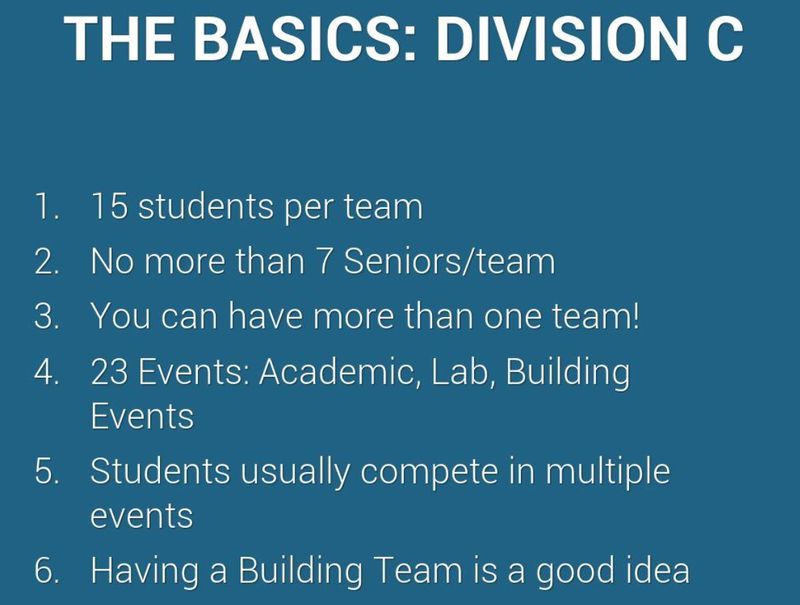 See Ramsey in his TED Talk on 3 Rules to Spark Learning. With real live Vernier chemists, I did spectroscopy and tested pH, temperature, conductivity, melting point. I learned straight from Jack Randall, writer of the Vernier Lab Manuals that I use. I also spoke with the specialists who answer our desperate phone calls when we stumble and need assistance with our treasured probeware. I met a young lady who is passionate about her job. But, she is not a high school chemistry teacher. She is an aeromedical chemist who does technical writing and editing for the US Army. 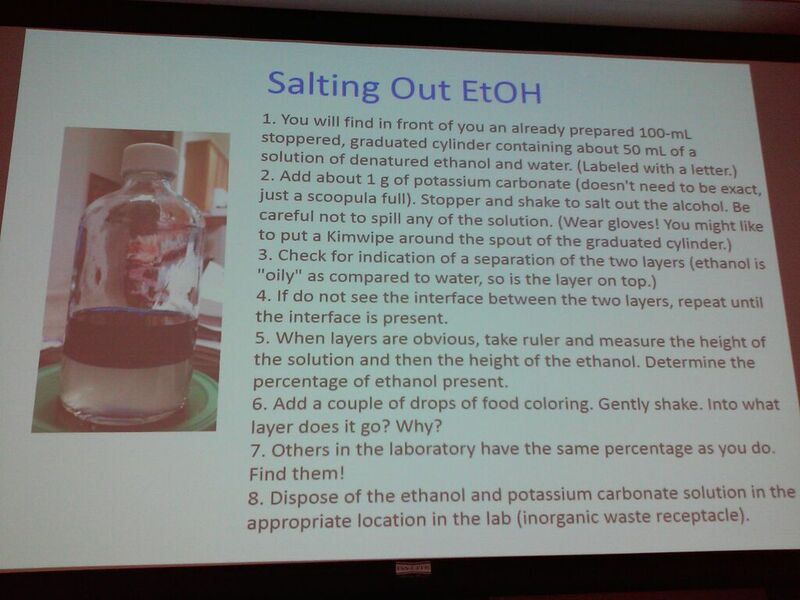 She attended ChemEd to learn activities for their STEM Outreach program in Enterprise, Alabama. She explained to me how helicopter seats are designed and how testing is done on medical equipment used in aircraft. With glee and enthusiasm, she delivered what might ordinarily be drab information. I was fascinated with the passion she must bring to the kids. The summer program that is so highly acclaimed and attended by kids Grades 4-12 is called the GEMS program (Gains in the Education of Mathematics & Science). Army Research Labs from the following states participate in the GEMS program: Alabama, Delaware, Illinois, Maryland, Massachusetts, Mississippi, New Mexico, and Texas. See pics of the cool stuff kid have done in the GEMS program. #molympics! I met two educators, Kristin Gregory and Doug Ragan, who get as pumped up about Mole Day as we do at East Coweta High School. Their students compete with each other and with students they have met via the internet. Classes from Michigan, Ohio, Oregon, New Mexico, and Massachusetts competed in 2014. Some of the brilliant events include Stopper Tower, Sponge Squeeze, and the Avogadro Fitness Challenge. I can’t wait to participate with them on October 23, 2015! I did not get to participate in the Mole Day Run on Thursday morning, but I’ve always been impressed that most chemists love to exercise. For those who were visiting from out of town, the run provided a reason to exercise outside of the hotel gym and with fellow teachers. I also met members of the National Mole Day Foundation. Pretty cool. AP Labs…They are my nemesis. Fortunately, veteran AP Chem teachers Jeff Bracken, Paul Price, and Jesse Bernstein have written lab manuals abundant with user-friendly, manageable, inquiry labs. I can’t wait to start using their resources and providing my students with new experimental adventures. 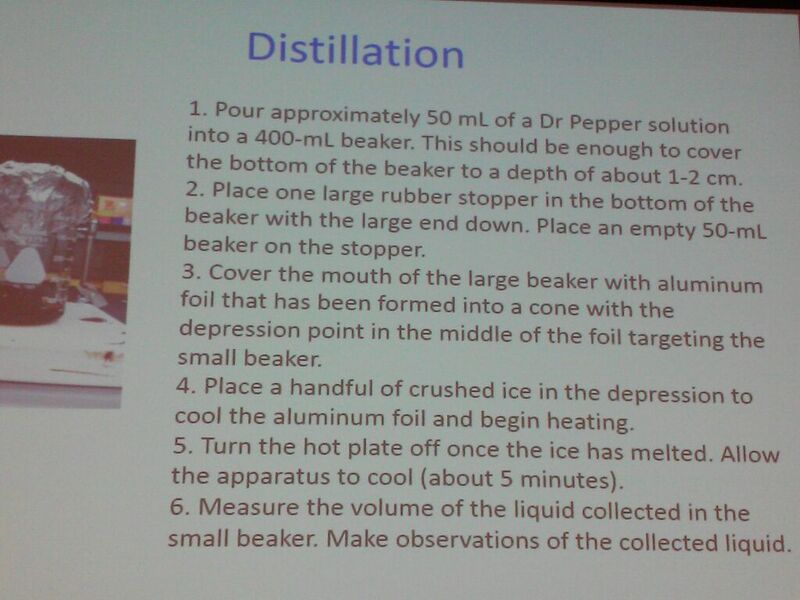 Distillation Setup: This apparatus will sit on a hot plate to start the separation process. Foil is in a pointy cone shape (upside down). 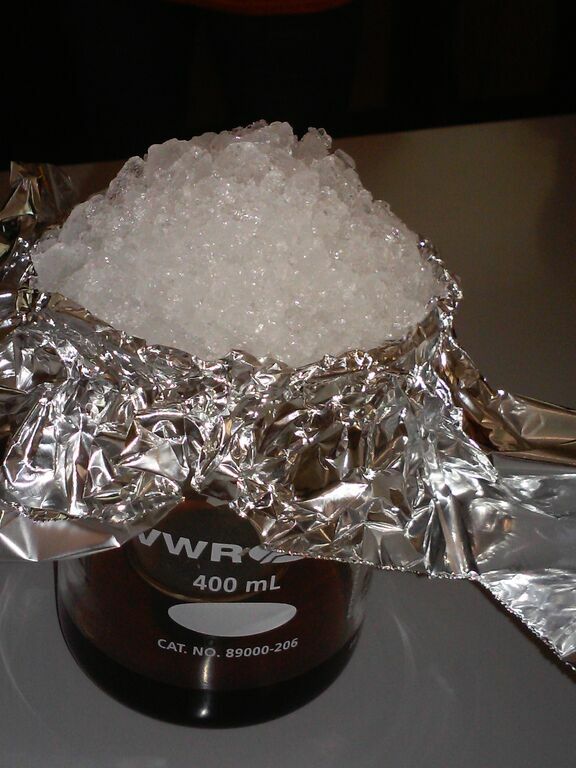 Salting of Ethanol Solution is a great Warmup Activity – Group H has to find their “match”…the solution that looks just about the same as theirs. 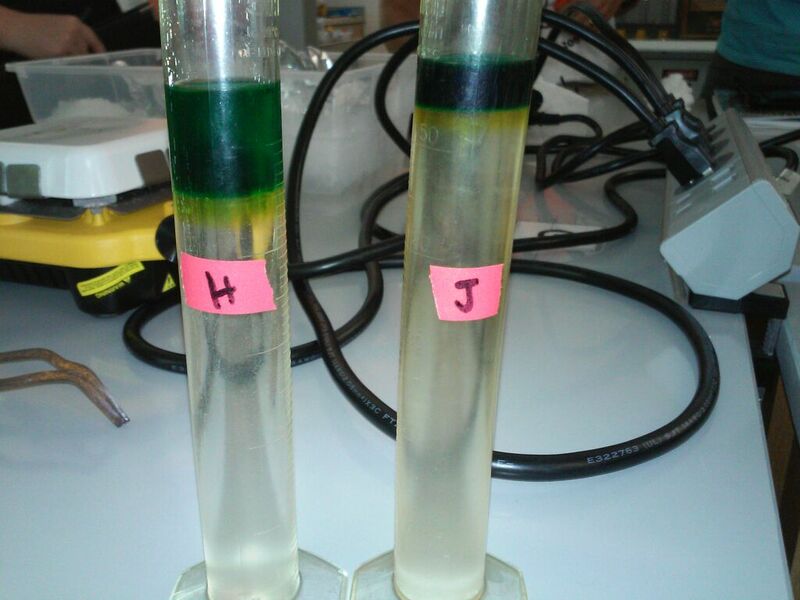 I had the opportunity to work alongside Adrian Dingle on an Acid-Base Half-Titration Lab. I have read Adrian’s work for several years now over the internet, I often use his well-constructed notes in my classroom, and I have participated in his online workshop. My students hear his name on a regular basis when I ask them to “Look at the Mr. Dingle notes.” They have even tweeted at him on occasion. I am fascinated by his ability to accomplish so much. He has written an award-winning book, How To Make a Universe With 92 Ingredients. He is now working on a book project, for which he was awarded a fellowship at the Chemical Heritage Foundation in Philadelphia, PA. You can follow his periodic table discovery progress: #dingleelements. Learning how to incorporate engineering skills in the chemistry classroom has been one of my goals. Growing up, I heard people vaguely talking about engineers, but nobody ever told me what engineers actually did. My goal is for students to have some engineering experiences during high school so they are better prepared to choose a major in college. Three specific labs I learned about include copperplating, can crushing optimization, and designing a new cool polymer toy. Thanks to Dr. Sarah Boesdorfer for sharing these resources. My friend and colleague, Dr. Karen Pompeo, and I presented a session on Modeling with Whiteboards. We explained the idea of visible thinking through particle diagrams, and we explored discussion strategies. Although our colleagues Candice Mohabir and Stefanie Easterwood weren’t with us at the conference, our recent year of teaching as a close-knit team provided us with plenty of experience. 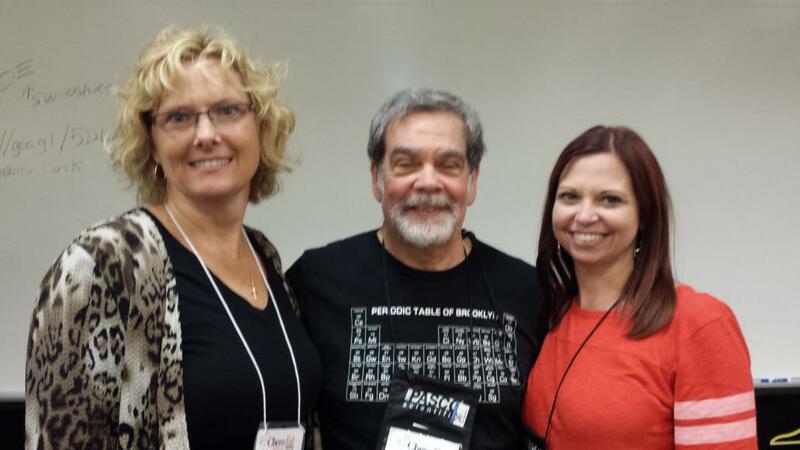 One of the highlights for Karen was meeting two of her modeling mentors: Larry Dukerich and Erica Posthuma Adams. Teachers Kyle Nackers and Micah Porter shared their expertise on “Promoting Scientific Writing in the Chemistry Classroom.” They showed us entertaining writing prompts that provide a basis for scientific reasoning and writing. Deflategate, movie clips, and You Tube snippets provide rich material for writing in the science classroom. Dr. Mary Virginia Orna spoke to us about her book, The Chemical History of Color. We learned that, centuries ago, it required 10,000 Murex snails to produce 1 gram of royal purple dye. The 6,6′-dibromoindigo was so valuable that if anyone other than royalty wore the color purple, they risked a death sentence. Dr. Orna has also co-authored The Lost Elements: The Periodic Table’s Shadow Side. In 1999, the ACS awarded her the George C. Pimentel Award, the highest and most prestigious award in chemical education. The highlight of the day for me was when she told me that she had attended my session on whiteboarding and learned from Dr. Pompeo and me. Imagine that! 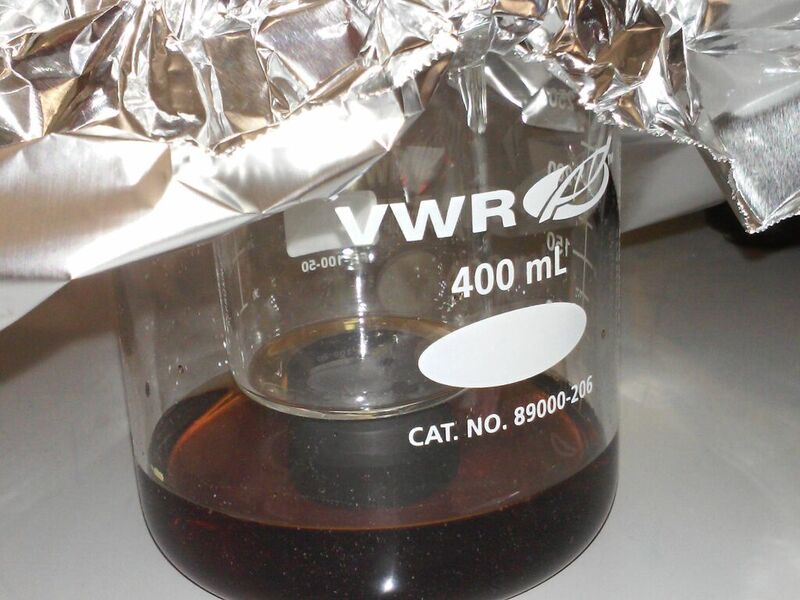 It delighted me that I was able to impart a bit of information to an experienced author and chemist. The next time these chemistry teachers will convene in one place is scheduled for the last week of July, 2016, in Greeley, Colorado. If I hope to go, then I will surely be applying for an ACS Professional Development Grant. Dr. Richard Schwenz, of the University of Northern Colorado, will chair the event. Dr. Schwenz was the instructor for my first ever AP Chemistry workshop years ago, so his experience is sure to produce a successful conference. Until I see these wonderful folks again, I will be socializing and communicating through Twitter as @marthavmilam. 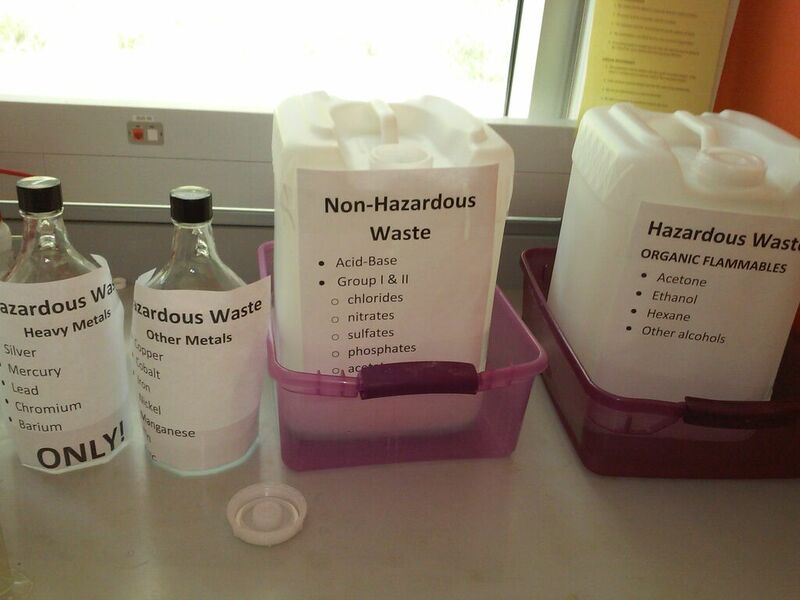 KSU Chemical Waste Containers. Found in each Lab Room. 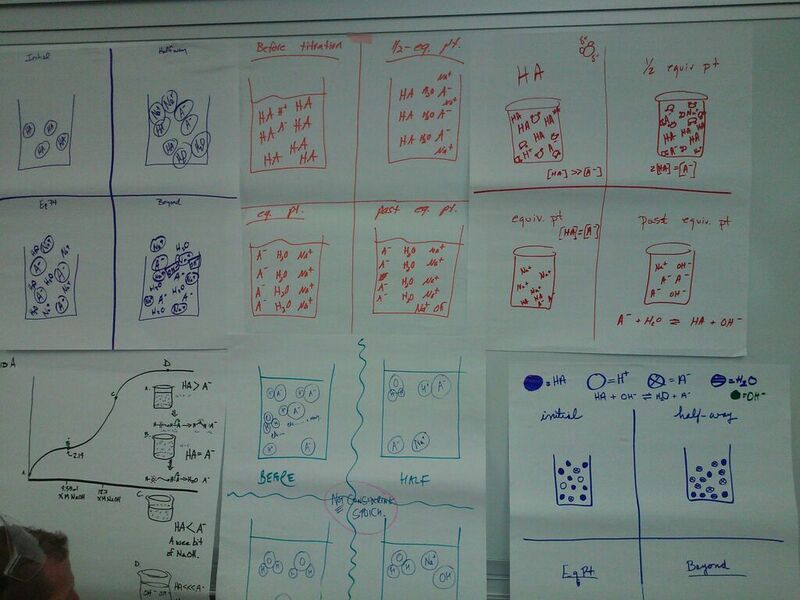 Collection of Particle Diagrams for Acid-Base Half-Titration Lab. There may be some mistakes, but as always, these provide a basis for discussion. When I wrote “Confronting the CHEATING Epidemic. Part ONE: Starting the Conversation,” I was frustrated and disappointed. I had just sent home a letter to all of my students’ families. (See the letter in the Part ONE blog). After digesting the information I have collected, I can share SIX POINTS that will reduce the cheating that takes place in our classrooms. 1) TALK ABOUT CHEATING. Once you meet your students, at the beginning of the semester or the school year, you need to start a conversation about cheating. It may seem negative, but it is necessary. It is like practicing fire alarms and code yellow drills. My instinct is NOT to talk about the negative issues, but GOOD teachers must address BAD things if it is something that will promote safety or ethical behavior. That is our job. 2) USE PRACTICAL PROCEDURES. Use different test versions. Separate kids during testing and have them use cover sheets/dividers. Have students write their names on the tests, even when it is a class set. (If they have a “B” test, you can verify that and they can’t claim to have had an “A” test, the same version as their neighbor.) For research papers, there are apps and programs available to check for plagiarism. Have students do their writing in class so you can monitor them. Take their phones away during testing. Talk to your teacher friends about what they do – we have come up with ways to stop the clever tactics. 3) USE PREVENTATIVE MEASURES. Offer some tests or assignments in which students are allowed to work together or use their notes and textbooks. Many times, we don’t consider how valuable it is for students to work with a partner on a test because they TALK about the material when it is a test grade. Some SERIOUS learning often takes place during a partner test. Many students, unfortunately, won’t crack open their notes unless it is an OPEN-NOTE test or quiz. Again, serious learning often takes place during an open-note quiz. 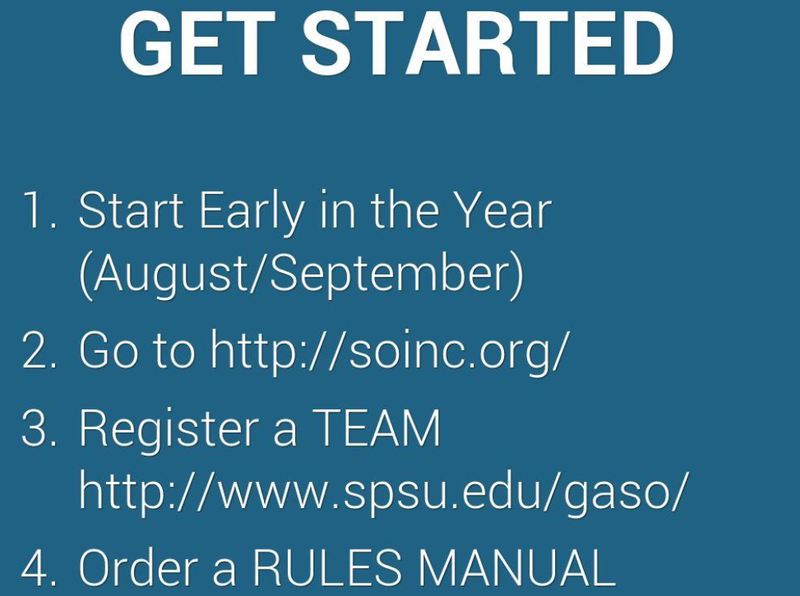 4) EVALUATE HOW YOU SET UP THE GRADEBOOK. Giving plenty of formative assessment before a big summative assessment takes the pressure off of the BIG test. Having plenty of grades in the gradebook allows students to have some low grades and remove the fear of one bad score tanking the grade. Also, allow students to correct bad grades. If they miss questions on a test, have them reevaluate those questions and explain what they did wrong OR explain how to find the right answers. This process is not only valuable in repairing bad grades but (more importantly) helps students achieve mastery of content. 5) STAY VIGILANT. Students will always need supervision. No matter how much we want to trust each one of our students, we need to watch them. THEY need to know that we are watching…because they need to know how important it is for them to stay honest. Eventually you will find someone who isn’t follow the honor code, and you will confront the issue. Not allowing dishonesty and confronting the situation sets the expectations for your students that cheating is not allowed in any manner. 6) KEEP TALKING. Keep having open and casual conversations about cheating. Have conversations about how they could do an assignment without cheating and still maintain their grades. Many times, cheating is a result of feeling overwhelmed or due to a lack of confidence. Often, students cheat because they assume their friends know more than they do, and they may copy someone’s wrong answers. Assuring students that they are capable of doing well is part of the conversation. Listen carefully. Kids need to feel open enough to tell you about things they are doing in other classes; they will let down their guard and tell you WHY they are doing these things. Don’t be too judgmental or too harsh. They need to feel SAFE enough to talk, and they need to feel like you CARE as you explain to them how to be their most honest selves. Collaborative Educators, including myself, like to focus energy on the positive, joyful aspects of teaching and learning. And there are so many exciting adventures in which we can immerse ourselves. Teachers do get discouraged, however, and instead of ignoring the negative, we must decide to fix what’s wrong. So, we need to address and analyze what’s wrong. That doesn’t sound fun, especially now as April moves quickly on toward May, and teachers, I mean students, get antsy for summer vacation. I have confronted cheating incidents in my classroom, and it is never pleasant. I continuously monitor students for cheating, of course, so I have to think about it regularly. I don’t like thinking about negative things, but I must. Cheating makes me angry, and when I am angry I am not as compassionate and optimistic as I would like to be. My anger affects my students’ attitudes as well as my own mindset. Instead of dwelling in this anger and frustration, I realize it is time to take action. Yes – Take Action. The first step requires that we have a conversation about cheating. Cheating is ugly, and talking about cheating is even uglier. It is ugly because we have to speak to people about the fact that they, their friends, or even their children, have been dishonest and untruthful. We are not talking about making bad grades; that’s an easy conversation. We are claiming that our students are damaging their own character and reputation. We are implying that their morals and values are low or wrong. We have to look people in the eye and tell them something that hurts, and then we must watch their reaction as they process the ugly truth. I have written a letter to send home to my students’ parents. I will discuss the issue thoroughly with my students, of course, but their families need to be aware of the impact of cheating, so the communication is vital to changing things. BELOW is the LETTER for my students and their families. Let me know what you think. In my next post I will address simple ways to prevent cheating…. Cheating has become a “normal” part of life for many students. Cheating can have serious consequences and can damage character, reputation, and self-worth. As evidenced in the Atlanta Public Schools (APS) cheating scandal, cheating can become a group effort, it can become a way of doing things, and it can seem acceptable because “everyone” is doing it. The cheaters in the APS scandal are now facing up to 20 years of jail time for something they thought was “okay” at the time they were committing the crime. Teachers know that cheating is common, and even though a student might not get “caught”, and the teacher may not have full proof of student actions, teachers are generally aware of intentions. Just because the teacher does not “accuse” you of cheating or speak to you about it does not mean it is acceptable. 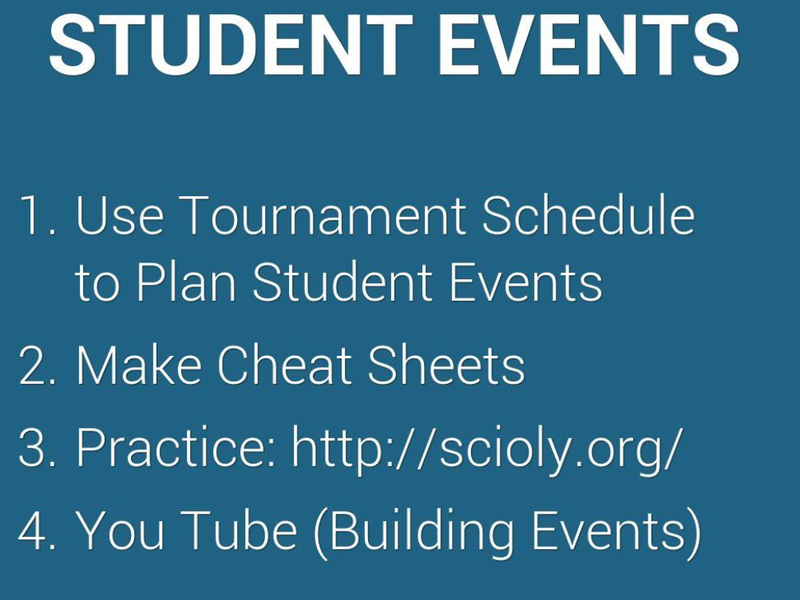 Cheating has become common enough that there is a way to notify parents of student cheating in Infinite Campus. Copying other students’ paper before classmates turn it in. Saving work from one semester to give or sell to students in the following semester. Saving work from one block to give or sell to students in the following block. Looking at another student’s paper and copying their work. Allowing another student to look at your paper to copy your work. If a teacher finds that you have participated in any of these actions, you will receive a zero for the assignment. Cheating is actually devaluing your education. Because of cheating, teachers need to spend more time creating new projects & assignments, conferencing with parents, assigning zeros and then working with students who are upset they got zeros. Teachers, therefore, spend less time creating new, exciting lessons and writing grants to purchase cool new equipment for the classroom. Their positive energy is diminished and replaced with negative attitudes toward the population of students who are cheating. Disappointed teachers may teach less effectively to the entire class based on the actions of the cheating students. Government and private enterprise (business) employers are now seeing the result of student cheating. They have voiced complaints that young employees do not learn and comprehend well. Many students are less capable of retaining information because they simply are not developing their study skills. a) Do you cheat occasionally? b) Do you cheat only if you didn’t have time to study? Do you think cheating is okay? Do you not consider some of the points listed on the previous page to be cheating? Do you think cheating is okay if the teacher doesn’t catch you? Are you bored with this document because it is wasting valuable cheating time? Do you feel bad that you have cheated? Do you think cheating is okay because your family expects you to make good grades? We need to STOP the cheating cycle. The purpose of your education is for you to LEARN, to analyze, to process information, and to create quality work. Students and teachers need to work together to increase the value of YOUR education. If you see cheating, let your teacher know. Your name will not be revealed…it’s all confidential. You need to choose not to cheat from this point forward. If you have never cheated, WAY TO GO!!!! You are the kind of student that makes it great to teach young people in America! If you have participated in cheating, and you decide that you think it is the wrong thing to do, then simply make the decision NOT to cheat from this point forward. Teachers will really appreciate this commitment from you because it reflects strong character and a trustworthy reputation.